Yet, think of all that can be accomplished through effective church committees, boards, or ministry teams, when people come together, putting their differences aside, working cohesively for the greater good. 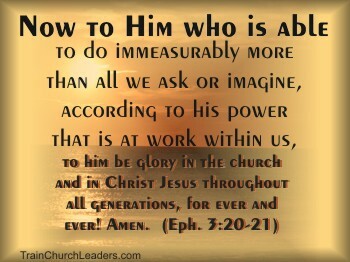 We need God’s Power to have Effective Church Committees or Ministry Teams! Look at the list of God’s power sources for us as His Church. We’ll eventually look at each of these sources as it relates to committees or ministry teams. For now, however, take some time to read about each by clicking on the links below. Reflect on how the power of God can help you function more unified to the glory of God and the accomplishment of His desires. Which of these power sources might you need to tap into more for more effective church committees, boards, or ministry teams? When you consider all the power God makes available to us through various means, we have no excuse for dysfunctional, ineffective church committees, boards, or ministry teams. I really love this article for it is helpful for the body of Christ and I would like to read more of your helpful articles.Thank you and God bless you as you are a blessing to the world by God’s grace AMEN. I praise God that these articles are beneficial to you. You can be notified by e-mail of new posts if your subscribe to the Practicum. May you and the Body of Christ there grab hold of His power and shine brightly to His glory! ← Previous Previous post: Who Sets the Vision?